BUREAU OF STATE SECURITY (BOSS). CANADIAN SECURITY INTELLIGENCE SERVICE (CSIS). CHINA, PEOPLE'S REPUBLIC OF (PRC). COMBINED BUREAU FAR EAST (CBFE). COMBINED INTELLIGENCE CENTRE IRAQ (CICI). 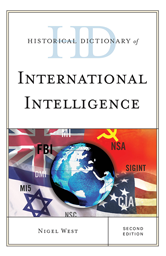 COMBINED INTELLIGENCE FAR EAST (CIFE). COMMUNIST PARTY OF GREAT BRITAIN (CPGB). COMMUNIST PARTY OF THE UNITED STATES OF AMERICA (CPUSA). DIRECCIóN GENERAL DE INTELIGENCIA (DGI). DIRECCIóN NACIONAL DE LOS SERVICIOS DE INTELIGENCIA Y PREVENCIóN (DISIP). DIRECTION GÉNÉRALE DE SÉCURITÉ EXTÉRIEURE (DGSE). DIRECTION DE LA SURVEILLANCE DU TERRITOIRE (DST). DIRECTOR OF CENTRAL INTELLIGENCE (DCI). DIRECTOR OF NATIONAL INTELLIGENCE (DNI). GREEK CENTRAL INTELLIGENCE SERVICE (KYP). GROUPEMENT DE CONTRÔLES RADIO-ÉLÉCTRIQUE (GCR). KOREA, DEMOCRATIC PEOPLE'S REPUBLIC OF (DPRK). KOREAN CENTRAL INTELLIGENCE AGENCY (KCIA). MINISTRY OF STATE SECURITY (MSS). NATIONAL AIR AND SPACE INTELLIGENCE CENTER (NASIC). NATIONAL GEOSPATIAL INTELLIGENCE AGENCY (NGIA). NATIONAL IMAGERY AND MAPPING AGENCY (NIMA). PHILBY H. A. R. (“Kim”). PROVISIONAL IRISH REPUBLICAN ARMY (PIRA). SPECIAL AIR SERVICE REGIMENT (SAS).